This innovative program is the oldest and largest student-run LGBTQIA+ health forum in the country. 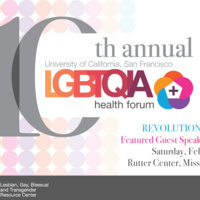 The forum educates attendees from around the country about healthcare disparities faced by LGBTQIA+ individuals and their communities, and aims to prepare current and future healthcare providers on how to better serve the needs of LGBTQIA+ people. All interested health professional/graduate students and community members, whether LGBTQIA+ or not, are warmly invited to attend this popular annual event. All attendees must purchase tickets. We are so thrilled to announce that JANET MOCK will be our featured guest speaker. Full schedule and speakers will be available in January 2018.